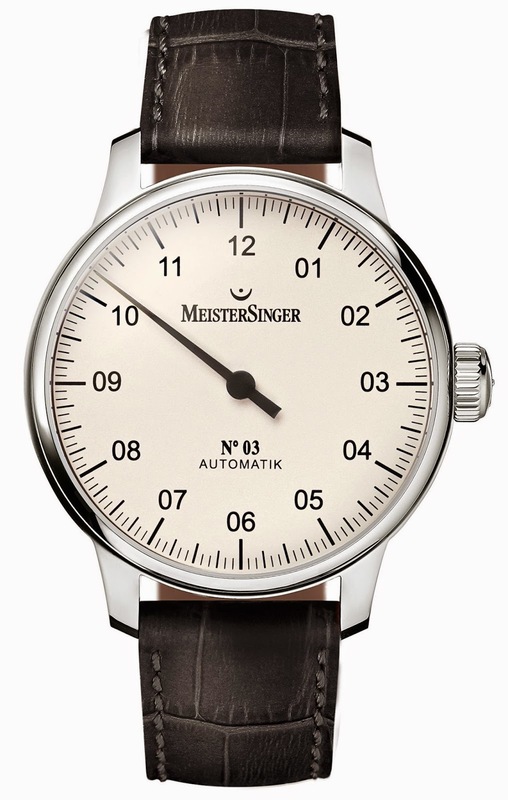 Launched in 2011, this automatic watch follows the footsteps of MeisterSingers N° 01 that has to be wounded by hand. The typical clear Look of the watch leads its carrier to the heart of the brand and reflects the principle of simple elegance: The fine hand of the watch and a very clear typography of the dial are evidence of symmetry and balance. No sweep hand, no minute hand, no date, no trailing pointer, no second or third time zone. In this model, timekeeping is looked after by the Swiss made self-winding movement that beats inside the case. These classics of MeisterSinger are available in two dimensions and different colours: silver – white, classic ivory, and sun decor anthracite (43mm). Furthermore, the black dial is available in two alternatives: hands and figures in white and red gold.